Looking at surreal, beautiful painted, whimsically detailed pictures of bird princesses of many lands makes me very happy and strangely peaceful. 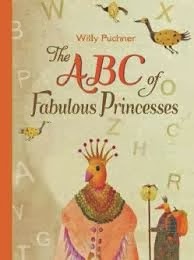 Therefore, I love The ABC of Fabulous Princesses, by Willy Puchner (NorthSouth Books), truly, deeply, and sincerely. The ABC part (each princesses' name, country of origin, interests, etc. all start with the same letter) was a perfectly acceptable framing device for the lovely bird princesses of many lands. It was reviewed at Kirkus and Publishers Weekly by people who paid a lot more attention to the words than I did. This book would make a lovely present for the right sort of person. I bought it as a present for me, because I knew the moment I saw the cover (at Kirkus) that I would be the right sort of person. Many of you (though I'm not sure how many) would probably like it very much too. I want to scan all the pictures so that you could see them in all their lovely detail and we could talk about which one was our favorite, and which ones we would like to be friends with and which secondary creature is cutest and so on, but of course I won't. But here is the procession of princesses from the endpapers, which you can see in bigger form at NorthSouth's facebook page. My least favorite is Princess Zenobia (the only one in pink, but I think it is coincidence), but I do not know which is my favorite. I will probably be drawing bird princesses on and off for the next several days, which will be nice for me. It would also be very fun to make bird princess paper dolls. One could, of course, also make bird princes. This sounds fun - that end-paper illustration is bright and fun, but in an arty way. Now I have to read this! If any of you all do read it, let me know know if you have a favorite bird princess! This book looks ridiculously cute. that one looks as diverting as all get out! And I hope your daughters do like this one!